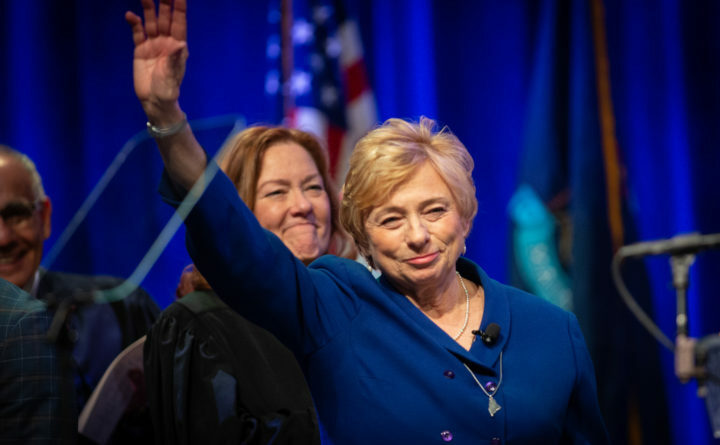 Democrat Janet Mills waves to the crowd after being sworn in as Maine’s 75th governor on Jan. 2, 2019. AUGUSTA, Maine — On her 100th day in office Friday, Gov. Janet Mills was sitting at her State House desk and in front of her were red, hardcover books containing Maine’s labor laws from a bid to help salvage a sick-leave bill that’s at risk of failure. It illustrates the hands-on way the 71-year-old Democrat has approached her new job, highlighted by quick reversals of her predecessor, a $8 billion budget proposal faulted by some on her left and most on her right, and a dug-in defense of an unpopular utility project slated for her home region. Peter Mills, the governor’s brother and head of the Maine Turnpike Authority, said his sister has been “bouncy” when he’s seen her since she took office, but she was a bit solemn at the end of an interview Friday, noting her time in the Legislature during the last U.S. recession. Some progressives wish she were less cautious. Republicans will scoff as their state party sells T-shirts featuring former Gov. Paul LePage’s face, reading “MISS ME YET?” Mills’ approval rating, however, stood at 55 percent in a March poll — higher than any mark ever for LePage. Mills’ campaign was defined by LePage, who sparred often with her when she was attorney general. While he blocked voter-approved Medicaid expansion, her administration began covering people in her first week in office with more than 19,000 covered as of Friday. LePage left office presiding over record surpluses due to a strong economy and the fact that his administration often did not fill vacant positions. At least 737 new state employees have been hired since Jan. 1, with 497 filling vacant positions, a 4.6 percent increase in the workforce that Mills has argued is needed, particularly in public health and education positions. There have been few contentious votes on the chamber floors in the Democratic-led Legislature so far, and Mills has largely been in a honeymoon phase with her party in public after taking over for the bombastic Republican, who presided over a state shutdown in 2017. House Speaker Sara Gideon, D-Freeport, said there is “a lightness” in the State House. Senate President Troy Jackson, D-Allagash, cited a “cordial” tenor in the Legislature. Assistant Senate Minority Leader Jeff Timberlake, R-Turner, said he has had “pleasant discussions” with Mills. But while Democrats are happier than under LePage, there is friction. Mills vowed to not raise taxes in her budget and while her proposal increases aid to education and municipalities, it falls short of long-established thresholds for those programs that haven’t been met in a decade. In his office, Timberlake has a wall of Democratic bills deemed “bad” and a whiteboard with the spending level of Mills’ proposal, which is projected to be in the negative after the recent approval of another spending bill, though Maine budgets must balance. Most Republicans think it will lead the state to raise taxes in the future. Perhaps the biggest landmine for Mills has been her support for Central Maine Power’s proposed 145-mile corridor through western Maine to deliver Quebec hydropower to the New England grid, which was approved this week by utilities regulators but needs more permits. Mills backed it after parties inked a benefits package in February. She has cited a study’s finding that it would reduce carbon emissions to group it with other actions she has taken to address climate change, but it is politically toxic — especially around her hometown of Farmington. A poll from opponents found 65 percent opposition statewide and 88 percent in Franklin County last month. Mills defended the project at a March town meeting before Farmington voted overwhelmingly to oppose it alongside about a dozen other towns. Public Advocate Barry Hobbins, a former Democratic legislator who helped negotiate the benefits package, said the move “showed political courage that I haven’t seen in a long time.” But former state Sen. Tom Saviello, R-Wilton, a corridor opponent who endorsed Mills, hinted at a re-election liability, saying locals who backed Mills are “very concerned” about her stance. A coalition opposing the corridor has advertised against her without disclosing donors. There are bipartisan legislative proposals aimed at blunting the corridor, including one that would make each town in the project’s path approve it at referendum before it is built. Those bills could force a legislative showdown with Mills, but her position has only entrenched. “I want people to base their views and conclusions about the transmission line on facts and science,” Mills said. What little tension does exist among Democrats may lie between the new and old schools. Rep. Chloe Maxmin, a first-term climate activist from Nobleboro, wondered if the policymaking process is “compatible with really urgent crises” such as climate change and called evaluating Mills’ action on that issue “premature,” though she cited hope in her work under Mills. Mills has recently thrown herself into negotiations around the sick leave bill sponsored by Sen. Rebecca Millett, D-Cape Elizabeth, that some Democrats including moderate Sen. Bill Diamond, D-Windham, were wary of supporting. Supporters have not unveiled an upcoming revision, but they say it’s aimed at getting bipartisan support that Diamond attributed to Mills’ work. “I think she’s a pro, and that’s coming out,” he said. Correction: An earlier version of this story included an incorrect value for the percent increase of state employees.